This nicely furnished apartment is located in the friendly neighbourhood of Holesovice. When you consider the different parts of Prague, please remember that the system is a bit complicated - so you really can't say: the higher the number, the further away from the city centre. Prague 7 borders to Prague 1, which is considered the main centre of Prague. And a couple of minutes away you'll find several tramlines, if you prefer not to walk. 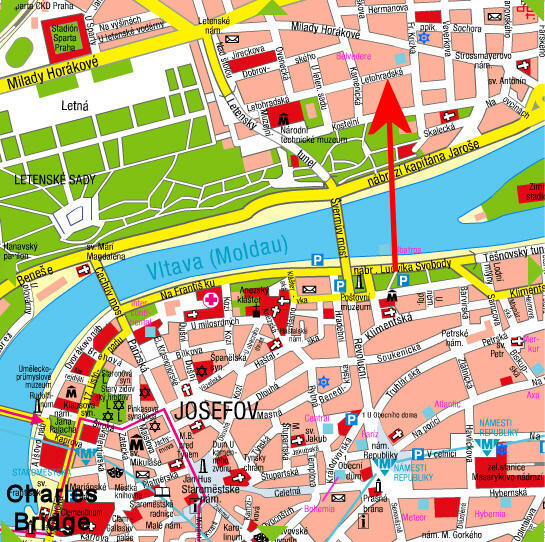 According to Google Map the Charles Bridge is around 28 minutes away by foot, the Old Town Square is 22 minutes and the Old town is around 18 minutes by foot. So absolutely possible - or simply take a tram. They are efficient and cheap. Close to the apartment you'll find the National Gallery of Modern art, the National Technical Museum and the very large and interesting Holesovice market (Prazska Trznice) which has clothes, shoes, bags, washing machines, food - you name it, they've probably got it! 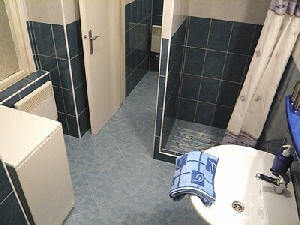 The accommodation consists of a livingroom, a kitchen area and a bathroom with separate toilet. In the livingroom there is a double bed, a double sofabed and an extra bed - plus of course satellite tv, sofabed, dvd/cd player etc. There is also aircondition. The owner has placed a computer there with internet connection - you can use it for free or plug in your own laptop, if you bring it. There is also WiFi for free. The large kitchen is more or less a living area as well, and here you'll find a comfortable bed for 2 persons and a dining area. The kitchen is equipped with a stove, fridge, microwave oven, electric kettle, coffee maker, ironing equipment and of course all the necessary cuttlery and tools. When you arrive you'll find some complimentary refreshments in the fridge, so you can relax and start planning your adventures in Prague. There is a nice bathroom with a walk in shower, hair dryer and a washing machine. The toilet is in a separate room. There is safe parking for free, which you'll rarely find anywhere in Prague. Usually the fee for parking is 15-20 Euros per night - so consider that amount saved! Letna apartment is good value for money! Stay more than 5 nights, transfer from & back to the airport for free of charge.